If you’ve been affected by Sunday night’s tragedy, here’s where to turn for support. The Harvest Music Festival shooting was the deadliest attack in modern U.S. history, leaving 59 people dead, including the shooter, and hundreds injured. For many in Las Vegas and beyond, the event is not over, and the road to recovery may be long. At High Country News our thoughts are with the victims and their families. A tragedy of this magnitude affects us all. We hope this list of resources helps. Submit a missing person request online here. In addition to hosting victims’ families, the convention center will help provide food, water, hotel accommodations, and transportation. Call 311 and file a report over the phone. File a report at an area command near you. If neither option works for you (perhaps because you are injured), an officer can come to you to take a report. From out of state, call (702) 828-3111. Allegiant Air is offering free air travel for family members needing to reach injured loved ones. For information, please reach out to [email protected]. Hillarie Grey, Allegiant’s director of corporate communications, recommends viewing Allegiant’s map before emailing to check available routes to Las Vegas. Miracle Flights, a Las Vegas based medical flight charity, will provide free commercial airline flights to families of shooting victims. For more information and to speak with a flight coordinator, call Miracle Flights at 800-359-1711. Allegiant Air will re-book Las Vegas travelers upon request without change fees throughout the week. For assistance, contact customer care at 702-505-8888. 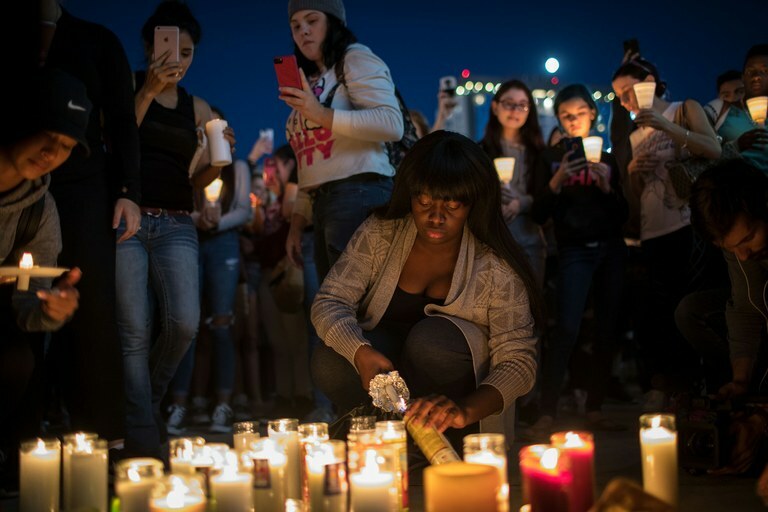 Mourners light candles during a vigil at the corner of Sahara Avenue and Las Vegas Boulevard for the victims of the mass shooting in Las Vegas. In Las Vegas, the Community Counseling Center of Southern Nevada — where all counselors are certified in trauma treatment — is offering free counseling throughout the week. While Deputy Director Aaronelle Matta recommends calling ahead to ensure counselor availability, the center is doing its best to prioritize those affected by the shooting, and if someone in crisis walks in for a counseling session without calling, that person will be seen. The Nevada Psychological Association has compiled a list of resources so you can read up on how to do the important emotional work that comes after a tragedy. Wondering how to talk with children about difficult news? Need a strategy for returning to normal life? Start here for some answers to these questions and many others, as well as a list of counselors offering free or reduced fee services in the Las Vegas area. Contact Martha Framsted, public information officer at the Nevada Department of Health and Human Services, at 775-684-3211 and provide your name, specialty, state, and contact information. Make an appointment at unitedbloodservices.org. Steve Sisolak, Clark County Commission Chair from Las Vegas, has created a GoFundMe page, where he’s collecting donations for shooting victims and their families. Add your own advice here. Impacts of this shooting will reverberate through communities across the nation and throughout the West. In an effort to move forward, we want to hear from you: How do you find solace in these difficult times?